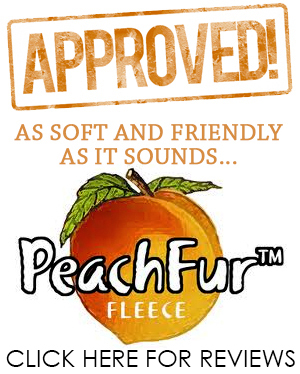 PeachFur Fleece offers a full selection of only first quality 320gsm anti-pile fleece fabric by the roll. Choose from thousands of fabulous designs, both solids and prints. Get our specialty printed fabric for only $5.75 a yard and our first quality solid fabric for $4.75 a yard. Or, inquire about bulk pricing. Get fast quotes and easy, no-hassle service from our friendly representatives. We only sell in large quantities full rolls 65 yards per color and prints we only sell full rolls and large quantities of fabric. Large quantities only - if you need small yardage we cannot help you! PeachFur Fleece offers a full selection of only first quality 320gsm anti-pile fleece fabrics by the roll.